Tommy Sheridan has gone from being one of Scotland's most popular politicians to the most scandalous member of the Scottish Socialist Party. Love him or hate him there's no escaping his drama filled life. I, Tommy explores the rise and fall of Sheridan’s career to date, from the salacious swinging accusations to the hard-fought battle with the News of the World to an appearance on Celebrity Big Brother. 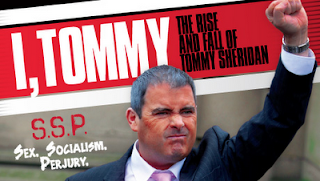 Undoubtedly Sheridan’s outrageous life story is one that’s waiting to be told but, despite the best efforts of the energetic cast, I,Tommy is not the right outlet for it. Des Mclean plays an exaggerated, almost caricature, version of Sheridan and bears a remarkable resemblance both physically and vocally. However this stripped back, almost shallow character is really lacking in the effusive charm that Tommy is well- known for. Taking the role of Sheridan's former friend and fellow lefty, Alan McCombes, Colin McCredie’s narration guides the audience through Tommy’s life. The small cast of five are impressive, deftly representing several key players in Sheridan's life - including his own wife and mother. Ian Pattison’s script is funny in parts, but – particularly in Act II - seemed to be an endless deluge of Scottish slang and swear words that a non-Scottish audience would struggle to follow. The courtroom scenes in particular seem more suited to a pantomime than a political satire. From courtroom to bedroom the audience is given a backstage pass to some of Sheridan’s most iconic moments but there is a more powerful story to be told and I, Tommy falls short of the mark.